The Check in staff were great doing their Jobs. long day and i was very tired from the Taxi Driver got us Lost & put more cost on my cab Ride. The room was great for me to get rest each day . The Breakfast was very nice each morning with the cleanup crew walking and cleaning the tables as people left the dining area's each morning . I enjoyed the Staff taking turns cooking behind the Noodles and fresh Waffles . This was a personal touch as i enjoy cooking and seeing this added a nice touch to the stay. I only had breakfast each day as i was off seeing the sights and visiting my friends. The Staff @ the front Desk were very helpful with the directions each day. Mickey. The Staff into the eating area were very Nice Also . Each person would greet you as you walked into Dine. The room was very clean every day also. I've stayed in Holiday Inn's in Nevada & California before so it's been nice to stay in 1 In Beijing,China. Thank You very Much to the Staff. Very helpful and friendly front desk staff. We both used our cell phone translation apps to overcome any language barriers!!! clean practical hotel at a reasonable price. Good location between airport and downtown if you are OK with not being in center. Shuttle service to airport, and breakfast were great! Good location for those who wants Airport, International exhibition center and hospital (just opposite) at a reasonable price. Staff were very efficient and helpful. Easy check in and check out. Comfortable bed, a lot of trees around. No thrills but clean. Comfortable bed and pillows, buffet breakfast, lounge area with big screen TV, bathroom & shower, close to BJIA. Easy check-in, decent room, comfortable bed & many pillows, diverse breakfast - they make eggs for you, great shower, shower head & pressure, many big mirrors, good WiFi. 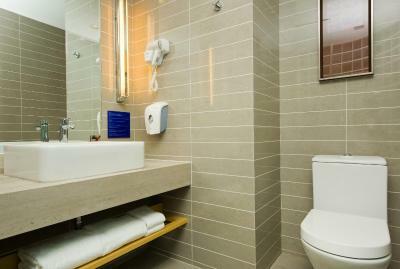 Located within a 15-minute drive of Beijing Capital International Airport, Holiday Inn Express Beijing Airport Zone is a hotel offering comfortable environment, free wired and wireless internet in the entire hotel. The property is fitted with a business center and meeting facilities. It also offers fax/photocopying and laundry services for guests’ conveniences. Free parking is available on site. Staying guests may enjoy free transportation service to the airport on settled times from Monday to Friday. Holiday Inn Beijing Airport is a 40-minute drive from Beijing Railway Station and a 15-minute drive from New Exhibition Center. The Central Villa District surrounds the hotel and it is just a way across to Beijing Ditan Hospital and adjacent to the new International Exhibition Center. 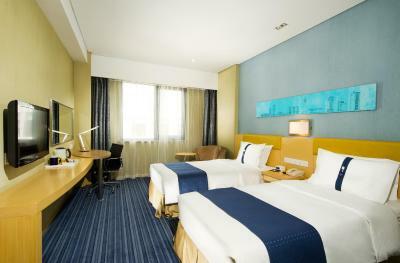 When would you like to stay at Holiday Inn Express Beijing Airport Zone? 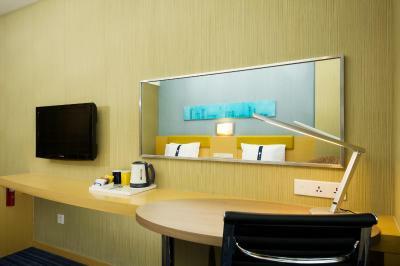 The modern decorated twin-sharing room comes with carpeted floor, a seating area, a LCD TV and an electric kettle. 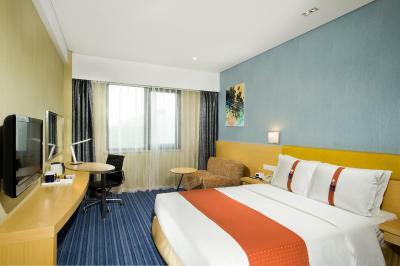 Decorated in warm colors, the bright room comes with carpeted floor, a seating area, a LCD TV and an electric kettle. Room comes with a safety deposit box, a seating area and free toiletries. It is located in Beijing Link Park where close proximity to the airport highway is. It is only 15 minutes’ drive to Beijing Capital International Airport. The Central Villa District surrounds the hotel and it is just a way across to Beijing Ditan Hospital and adjacent to the new International Exhibition Center. 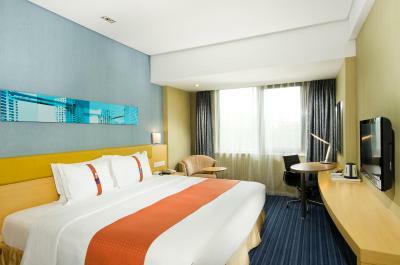 The hotel has exquisite fashion guest rooms with comfortable environment. The hotel also owns a complete set of conference room and food service facilities, more convenience for your business activities. All regions are covered by wired / wireless broadband which guest can use during their stay. The hotel boasts its green & comfortable environment which is simply necessary elements for hosting any kinds of Meetings. Guests in our hotel can enjoy our transportation service to the Airport. From Monday to Friday, the time at 7:00am, 9:00am, 11:00am & 1:00pm. Please contact our front desk regarding your arrival. House Rules Holiday Inn Express Beijing Airport Zone takes special requests – add in the next step! Greatwall Holiday Inn Express Beijing Airport Zone accepts these cards and reserves the right to temporarily hold an amount prior to arrival. Holiday Inn Express Beijing Airport Zone accepts these cards and reserves the right to temporarily hold an amount prior to arrival. Help full staff. Good location to stay night and wait you flight. Shuttle bus to Airport. Tried to get a taxi and the front desk manager asked us to ride with other party. We agreed but he called small sedan taxi instead of full size suv. I booked this hotel only because there was an offer of a transfer, but in the end I found out that there is no transfer! And I had to look for a taxi which was uncomfotratible in a country where people don't use English. Breakfast: I have an early leave and asked if I could have a breakfast bag with me and got a refuse. Not close to the airport- about 20 minute drive away. Would not recommend as it is not accessible from the airport. There is only a shuttle one way, and very infrequently. We asked 4 different cab drivers and no one knew where this hotel was. I would not recommend this as an “airport” hotel. I didn't find anything nor have any problems during my stay 3 days @ this Site. I will stay here on my next visit to Beijing, China to Vacation and Visit my Friends . I will hold you to the Same Standards as was during my Visit and stay at this Holiday Inn. I've never seen a staff work so well together and greet you each time they see you. Some staff at the reception friendly but some other staff at the reception very little helpful, almost rude!